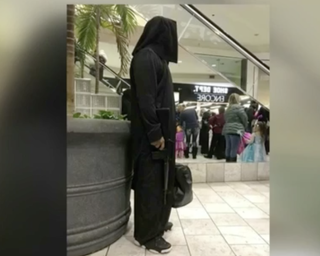 An Omaha, Neb., man is now at the center of a heated debate after he wore a costume that some are calling inappropriate to two children’s events at two local malls over the Halloween weekend. According to KMTV, several parents at Oak View and Westroads malls became concerned Friday night after they saw the masked individual, decked out in a black robe and carrying a duffel bag and a long gun whose orange tip, which would have designated it as a toy, visible only when the gun was pointed. Several families were at the Oak View Mall attending “Monster Mash Bash,” which was held in conjunction with the Southwest YMCA. Omaha police were called, and they determined that there was no threat. However, Desirae Anson said that her and her family’s trip to Oak View was cut short after the costume made her uncomfortable. April Baker, who took the photo of the man, said that she heard from other parents that the costume was a joke; however, she didn’t find it funny, especially since the orange tip was not visible from the side profile of the toy, which is how the man was carrying it. Meanwhile, the man in question, Hugo Mendoza, said that he doesn’t see what all the fuss is about and voiced his surprise at his photo going viral. Mendoza explained that his costume was inspired by the 2010 movie The Town. The father insisted that the costume was not meant to offend anyone, and pointed out that security never approached him and asked him to leave. “I didn’t put nobody’s life in jeopardy, nor did I point the gun, nor did I scare little kids,” said Mendoza. Read more at KMTV and KETV.